Shelter Continued: So I've packed tarps and a down bag. At the very least you'd expect some sort of sleeping bag cover to protect the down right? Well, you'd be right indeed. I wouldn't leave home without one. In this case it will be a full-blown bivvy bag. The eVent alpine bivvy from MLD. The nature of the area and trip demand, I think, such security and backup. Besides, windblown rain would be a problem even under the MLD Grace Duo if used by three. The MLD Alpine bivvy is super-light for what it is at 360g. I've used it in anger, in extreme wet weather, in combination with a micro tarp and it worked well. Like all bivvys things get a bit clammy when it's fully sealed but in that respect it's better than my other two Goretex bags. Some don't like bivvies for this reason but the truth is, in my experience, you very rarely zip them up fully in use. Certainly not when used in combination with a torso tarp. It has its problems. I'm not a big fan of crocodile opening bags (I now realise) and it's heavily tapered so won't accommodate a full length, wide, thick mat. It does however just work with my neoAir short. Kitchen: This is a sort of Frankensteins monster. It's a collection of bits and pieces I'd much sooner leave at home but that preparing meals for a large group requires. Willem-Maarten will bring a 2.5l pan. I'll pack a 1l Trangia pan because a second pan is useful when making large volume meals and because a smaller pan is better for brews. With the Trangia pan comes the evil Trangia pan grip which, although it works great, at 50g it's not far short of half the weight of the pan. In previous years I've taken a Trangia lid/frying pan along too. This year that's been ditched for a heavy gauge foil lid. Along with the pan comes a fitted cosy, homemade from floor underlay. The burner will be the Optimus Stella +. A massive 260g but stable and capable of supporting 4kg. I've not used anything but meths burners since I've been doing this kind of thing so this is unknown territory for me. So far, dry runs have shown me that it's extremely convenient. I have my reservations about it's efficiency in cold weather. Here comes another admission: I thought, being a remote canister stove, that I would be able to invert the canister and use it as a liquid feed stove when temperatures drop. I missed the bit about the Stella + not having a pre-heat tube. We may have a problem if temperatures really drop and will have to keep juggling switching between canisters warmed up in pockets. If we don't get it right we'll be packing canisters devoid of propane and may end up taking meals in the huts. If all goes well however the fuel efficiency of this thing is unreal. I'm using, under ideal conditions, an average of 16g of gas to boil a litre of water. At that rate a single 220g cartridge (355g gross weight) will boil over 13l of water. At 5l a day for the group one cartridge will therefore last more than 2.5 days. That's impressive. My white box stove is just 63g including wind shield and heat shield. That's 200g lighter than the Stella plus, but, if I where to pack enough fuel with the white box such that the starting weight was the same as that of the Stella + and gas I'd only get 2 days out of the White box. I knew that for longer trips the weight of meths eats up the weight advantage but doing the calculations shows that for groups the tipping point lies at just a couple of nights. Gas is the way to go for groups. I wonder even, if with a micro burner, its not the way to go for longer solo trips? Together with a few other bits and pieces my whole kitchen set-up comes to a whopping 600g. I could get away with less than half of that and still have a fully functional solo set-up. Footwear: I'll be wearing Hanwag Banks, full-height boots with Goretex lining. These are fairly ligh boots at 1400g the pair. To use the ridiculous British classification these are three season boots (does that make full-on, stiff-soled, climbing crampon compatible, mountaineering boots one season boots or are they really trying to suggest these things can be used all year round in the British hills?). Now I know footwear is one of the most emotive subjects surrounding lightweight backpacking so here's a few words explaining my position: I'm not anti trail shoes. Trail shoes make a lot of sense. For most people, most of the time, under most of the conditions they encounter, trail shoes should be the footwear of choice. Boots should be in the minority in the British Hills. Why then do I wear boots? Well that's partly habit. I'm from a generation that wore boots in the hills without question. Funny, I wore boots to walk but ran and orienteerd on the same terrain in fell shoes. Thinking back it doesn't seem to bare logic. However, I do think that to use trail shoes on technical terrain requires conditioning. Conditioning is something that I no longer have enough of and that I can't realistically expect to achieve living in Holland. I find myself in the mountains just once or twice a year and when I do end up on rough ground I'm glad of the protection I get from my boots. Now I know I could get into all colours of discussion on this last point. However, for the moment, boots work for me and I don't want to experiment and ruin one of my all too few trips. I may start playing with trail shoes at some point down the line but it will be some time, at best, before I'm confident enough to use them on high level routes. Camera: Well this time it's got to be the DSLR. 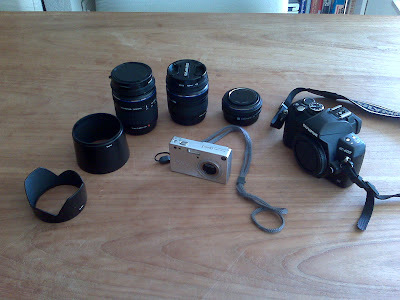 I had three main choices here: The Olympus E400 plus a choice of lenses, a Pentax Optio-S super small but limited micro compact or no Camera at all. Since retiring my OM10 I've only ever backpacked with the Optio. Last year I went without in the knowldege that others would take plenty of photos. I won't be travelling without a camera again. Not that the photos the others took in Switzerland are not to my liking (far from it) it's just that I like taking photos. This year we are heading for Norway and a spectacular part of Norway at that. I want my DSLR in my hand. Pure and simple. The compromise I'm making is to limit myself to a single lens. Only the 14-42mm zoom will stay in the bag. In old money that's 28-84mm which gives me a reasonable wide angle at one end and a reasonable zoom at the other. Even with one lens, and even though the E400 is a light and compact as á DSLR gets, it still adss a kilo to my base weight. I'll be sweating and no doubt swearing lugging it up 2000m peaks but I still want it with me. Maybe next year it'll be an Olympus EP-1 micro four thirds? There's a little more left to explain. But that's all for now. I was looking at the weight of the m4/3rds offerings today and comparing with the E-400/410/420. Using a 14-42 lens the weights are E-410 - 565, G1 - 580 and EP-1 485. Thats without batteries but IMO the EP-1 sacrifices too much useability to make the 80g saving over the E-410 worthwhile and the G1 only benefits from being slightly smaller. Not a easy choice *IF* I was in a position to buy right now but I think the E-400/410/420 is still the best option. Mac E: Been trawling through the details since the release myself. Yes it's dissapointing. My E400 with 14-150mm lens and strap now come in at 2g shy of 700g. The EP-1 would give me a saving of just 200g. Not fantastic but still if the other things added up I would take the weigt saving with a smile. However, I'm not convinced about the rest of the package. The worst of it is that there is no inbuilt rangefinder! There's an add on rangefinder for the fixed 17mm pancake but not for the zoom. I don't like this. You're forced to use the liveview all the time and appart from the consequences this would have for battery life and the number of spare batteries carried it forces you to shoot at arms length whch is much less stable. There's image stabilisation in the Ep-1 at least but I wonder if you will end up having to pack a tripod anyway. The only benefit I can see right now is that teh 200g saving and the smaller format might let me pack a reasonably functioning tripod without weight penalty against my current set-up. I live in hope though. Olympus has made clear that the intention is to extend the range. There will be models above and below the EP-1. The've also stated that they are developing an electronic rangefinder with the intention that it will be compact enough to do away with teh pentaprism bulge typical of SLR's. My fingers are crossed for a simple version without all the art filter gubbins, a useable electronic viewfinder a workable flash option and a nice robust housing.The suspense will carry on for a while yet. It appears we're looking for exactly the same thing. If you look at the E-300/330 shape and imagine fitting the smaller E-400 battery, removing the grip, removing all the mirror box components and reducing the size of the lens mount to that of the EP-1/G1 then it should be possible to have a body not much bigger than the EP-1 but incorporating the EVF. I think it will come though, when the E-1 was launched as the 1st E-System body it was criticised in the press as being too big even though it was a fully featured camera, looks like Olympus don't want to make the same mistake again so they've launched a reasonably well featured body but concentrated more on keeping it as small and light as possible. I generally use gas for longer trips and/or when out with my partner - I've use an F1 Lite that has served me well over the last six or so years. For shorter trips I'd use meths. Baz: I've never realy questioned my use of meths and have used either a Trangia or, more recently, a Vargo Triad or White box stove. I'd read Chris Townsends conclusions on the comparison of meths with gas before but always figutred that for the duration of trips I go on these days (3-4 nights typically) that there was no advantage in going over to gas. My calcs take me a bit by surprise since they suggest that even a very heavy burner like the stella plus comes in better than the miniscule white box stove. Of course I'm doing the calcs based on very large cooking volumes for a group of five. I need to look at the numbers for solo use. However, as somebody who likes, where possible, to cook "real food" on the trail I have to say that the convenience and controlability of gas is very attractive.